M.T. 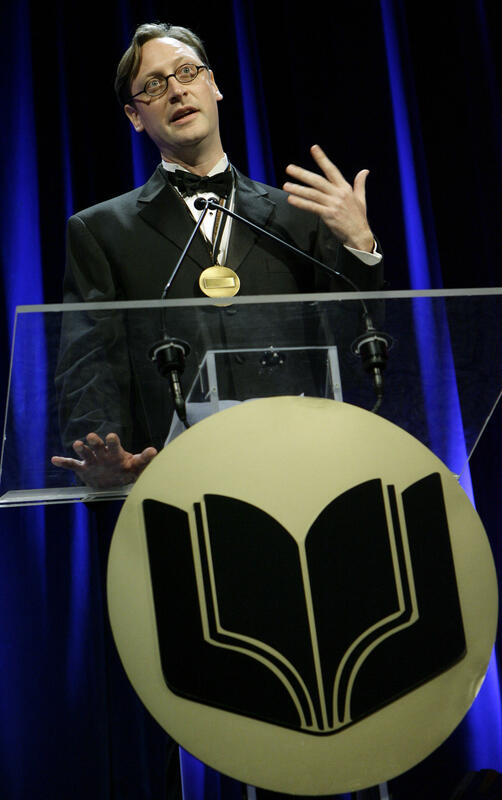 Anderson accepts the 2006 National Book Award for Young People's Literature. This week, he won the ALA's Margaret A. Edwards Award for his work in young adult literature. Anderson's work has explored dystopias both real and imagined. His latest book, The Assassination of Brangwain Spurge, delves into a world of goblins and elves, and that collaboration with illustrator Eugene Yelchin was a finalist for a 2018 National Book Award. His past books include Feed and the two-part series The Astonishing Life of Octavian Nothing — the first volume of that series was the winner of a 2006 National Book Award. Speaking from East Calais, where Anderson spends part of the year, he said he was "flabbergasted, but almost intimidated by the award." "It's been given to such an incredible roster of people that I felt almost bewildered, like, 'What have I done to deserve this?'" Anderson said. "My career has been focused more on teen stuff, mainly because I discovered that you can write the same kind of book for teens that you would for adults," Anderson said. "And that's been one of the real central elements of my career — has been saying, in many cases, these are books that could have been published for adults, but I wanted them to be published for teens. Because I want teens to know that there are adults who care about what they read and care about their intelligence and care about the things they care about." "The other portion of my work is actually books like the Octavian Nothing books, which are very firmly rooted in America's own history. I mean, they're sort of Gothic novels about the Revolutionary War — which like all Gothic novels are about crimes that have long been hidden," Anderson said. "Or my book, Symphony for the City of the Dead, which is about Soviet Russia and is actually a nonfiction book. There you have, in a sense, in both cases dystopian societies that are actually real. And I think that that is where I get the, you know, the emotional ... urge to write about dystopias in general, is the realization that in many ways, you know, we live in a dystopian society. It's just that we happen to live in the shining citadel." "I still have 40 years left, so what I probably am going to do is just slump lethargically for the rest of the time. This is the beginning of my lame-duck period, I think," Anderson said. "No, I mean obviously ... I can't wait to see what I think of doing next, you know? I mean it's always very exciting when you're in between projects because you can set off on any kind of journey then." The National Book Award is one the most prestigious literary prizes in the country, given every year since 1950 to celebrate the best writing in America. This year, three finalists for the award have links to Vermont. His books have taken readers to a world where internet connections feed directly into your brain. To the wondrous flame pits of Delaware. And most recently, to life during the Bolshevik Revolution and Stalinist Russia. And they have garnered acclaim and honors, including the National Book Award.